This reminds me of China Glaze Flip Flop Fantasy (which I don't own but have drooled over for many months) its a neon/Creme coral pink- its called Flamingo Flair and I can see where they got the name. It's pretty thick and requires some work to apply. I have 3 coats and it may need to be thinned a bit. I rarely match my nails and toes but with this color, I couldn't resist! It makes me look tan(ner) and has gotten me several compliments! Me and coworker again had matching nails. I'm so glad I've found some people at work who love talking makeup and nails as much as I do! To break up the matchy match of it all I added China Glaze in I'm Not Lion a gold and silver beauty! This to me screams Summertime!! 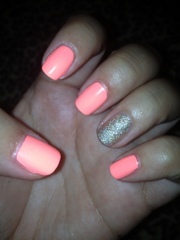 I LOVE this - it is the perfect Summer colour. Love the neon touch, but it's not too loud, like some neons can be! It is! I'm wearing it in my toes and love it so much more! Sinful colors of the week!